Forget Guns – Pennsylvania: Hunt. Fish. Shoot. Soon, Pennsylvania hunters can forget about using any modern weapon, and instead unleash the power of ancient weapons against the deer herd. So far, we have the flintlock muzzleloader, and the long bow. Many would even put the recurved bow in that category. 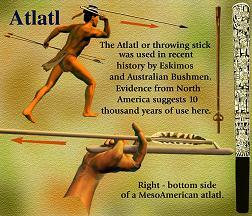 There is a movement to allow hunters to use an atlatl. Yeah, I had to look that up too. Game Commissioner Roxane S. Palone requested staff to prepare regulatory language to legalize the atlatl as a hunting device. Here are several pictures of altatl throwing. Here is a list of all the states atlatl hunting laws. Does that mean you guys will have to wear just a loincloth when you hunt? Yeehah!